And rising very early in the morning, while it was still dark, [Jesus] departed and went out to a desolate place, and there he prayed (Mark 1:35, ESV). When one reads Mark’s Gospel, it is easy to notice the miracles and healings. Mark emphasizes action. He talks about what Jesus did, more than about what He said. In Mark 1:29–39, Jesus healed Simon Peter’s mother-in-law and others, casting out demons and performing other miracles. Although Mark tells us that Jesus preached, he does not report much of what He said. However, in the middle of the story Mark mentions another important aspect of Jesus’ life. Although He was a miracle worker and preacher, He was also a prayer warrior. There are many ways in which we can never hope to be like Jesus; He was God in human form and the Savior of the world, two of many things we can never become. However, He was also a man of prayer, and this is one aspect of Jesus’ personality we can all learn to imitate. The idea of Jesus praying raises some tough questions for some people. Why would Jesus need to pray? If He needed anything, couldn’t He just perform His own little miracle to get it? Didn’t He already know all things? If He has all wisdom and power, isn’t it safe to assume that He did not need any help from anybody, even His heavenly Father? Such questions betray a misunderstanding about both Jesus and prayer. Yes, Jesus is the Son of God and He is all-powerful and all-knowing. However, as part of the triune God, Jesus always worked with His Father and the Holy Spirit. He never ministered without them. Jesus’ very nature demanded close communion with the Father. Jesus received guidance and directions from His Father, and through the Father’s guidance was able to perform His mighty miracles. It is no accident that Jesus was praying just before He told Peter that they needed to leave Capernaum and go to the nearby villages to preach (see Mark 1:36–38). Perhaps, during His time of prayer, the Father revealed that He must not stay in one town too long. There were so many towns, so many people in need of the Gospel, and Jesus had so little time in this world. Jesus knew it was time to move on because He had met with His Father. Furthermore, since Jesus received His itinerary from the Father through prayer, it was that much more difficult for people to distract Him from His mission and His divinely ordained schedule. Jesus received counsel and direction through prayer. Many Christians, however, tend to treat prayer like the Home Shopping Network or a department store. We pray when we want to get something. If we are sick, experiencing financial difficulties, or dealing with other serious crises, we pray. If all is going well, God may not hear from some of us for several days or weeks. In some cases, we might not pray for months until a crisis erupts. Yet, if we find Jesus praying often, don’t we need to pray even more? If we find Jesus getting up early in the morning and finding a quiet place to pray, don’t we need to do the same? Jesus prayed for His Father’s guidance. Likewise, we should make prayer a priority. Every one of us needs to set aside time to pray, as a first priority (not just when there’s “nothing better to do”) and ask God for direction and strength to overcome any challenges we may meet. 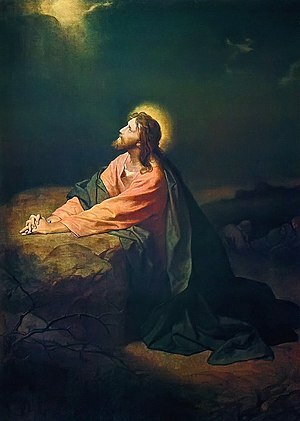 Perhaps the most familiar story about Jesus praying is when He prayed in the Garden of Gethsemane shortly before He was betrayed (Luke 22:39–46). His plea was one of the most familiar prayer requests in the entire Bible: “Nevertheless, not my will, but yours, be done” (Luke 22:42). This should be our prayer as well. In Twelve Step programs like Alcoholics Anonymous, the Eleventh Step is “[We] sought through prayer and meditation to improve our conscious contact with God as we understood Him, praying only for knowledge of His will for us and the power to carry that out.” Not only is this excellent advice for recovering alcoholics and drug addicts, but it is also an important lesson for Christians. As we pray, our first priority should be communion with God. Particularly in evangelical and Pentecostal circles, we speak of having a “personal relationship with Jesus Christ.” Relationships, particularly intimate ones, involve spending time together. In recent years, there has been a debate about whether “quality time” or a quantity of time is more important in fostering healthy families. When people started emphasizing quality time, it developed into an excuse for parents to spend long hours at work, devote little day-to-day time to their children, and then justify it by “making up for it” with “quality time” on a vacation. Recent studies, though, have generally shown that relationships are best fostered by a regular quantity of time. It is more important to spend regular time together when building a relationship, than to cram a lot of quality time in at sporadic intervals. We should nurture our relationship with God through regular quantities of time as well. As we pray, we should make intimacy with God our primary goal. We should become keenly aware of God’s presence. We know He is with us! You should be so confident of His presence that, if somebody should ask how you can be so certain there is a God, you might be tempted to say, “How can I doubt Him? I just talked to Him this morning. He was right there in my room! Of course there is a God!” Let us pray, believing that God will grace us with His presence, because He will do it. As we pray, God reveals His will for our lives to us. He sees the big picture that none of us can imagine, so we should be eager to know His will for us. Sometimes His will is not easy. He will call us out of our comfort zones. He will convict us of our sins and call us to repent. God’s will is usually not popular. He will frequently call you to choose between doing what is right and doing what is socially acceptable. This is not comfortable, but the eternal rewards far outweigh our momentary discomfort. That is why we also need to pray for the courage to carry out His will. In the last year or two, I have resumed a concerted effort to wake up earlier in the morning. My alarm goes off around 5:30 AM, so that I can pray for at least a half hour before driving to work. I have noticed that the days that I spend the most time in prayer are usually my best days. The circumstances I face are not necessarily easier on those days. I might face the same workload, traffic, and other sources of stress, regardless of whether I pray or not. However, when I leave my house with the peace that comes only through prayer (Philippians 4:6–7), He gives me greater strength, wisdom, and patience to get through the day. I invite you to take that challenge. Spend some quality time with God before you leave for work in the morning. Get up a little earlier (I admit, that is the hard part; the snooze button will beckon you) and read God’s Word before you leave. Ask God for wisdom, strength, courage, peace, and all the other spiritual blessings you need. Cast all your burdens, including the needs of those you love, on His broad shoulders so that you do not have to carry them all day long. Invite our Lord Jesus Christ to walk with you, guiding and directing you throughout the day. Invite the Holy Spirit to fill you with His divine presence so that you can make it through the day.